In order to accommodate more growth and density in Tacoma, the city has greatly reduced parking requirements and increased heights in downtown Tacoma and in the 17 mixed use centers in the city. These are probably smart moves. However, neighborhood and historical groups in Tacoma have consistently emphasized that the value of neighborhoods are more than just how many cheaply built units can be crammed into a particular lot. Hence, many of Tacoma neighborhoods have wisely resisted having the city permit developers to cram in attached and detached dwelling units (ADUs and DADAs) in the yards of single family residences. Expanding ADUs in single family neighborhoods essentially converts them to duplux or multi-family zoning. In the mixed use center revisions, the understanding was that downtown Tacoma and Tacoma's mixed use centers would take most of the growth while single family neighborhoods would be able to retain a neighborhood character. In April 2007, when threatened with such a proposal, the North End Neighborhood Council along with other neighborhood and historical groups opposed ADUs and the evisceration of single family zoning. Cramming multiple small dwelling units around every house in neighborhoods changes the function and look of neighborhoods. With 17 mixed use centers and downtown full of empty lots, there are certainly opportunities for expanded growth in the city without eliminating single family neighborhoods. Apartments and multi family areas are important, however, many Tacomans believe that single family neighborhoods should be allowed to still have some meaningful role in the City of Tacoma. 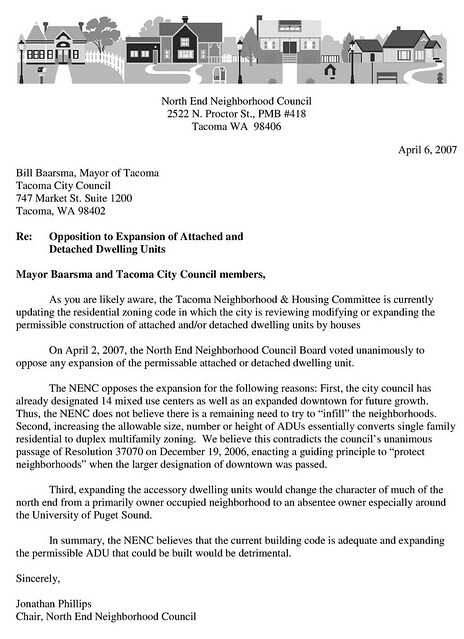 Around 2008, the Tacoma City Council agreed to a compromise with neighborhoods. Developers would be able to employ the expanded ADUs in most zoned areas in the city. However, single family neighborhoods would be spared. This compromise should not be breached. The New "Affordable Housing Policy Advisory Group" was a group of developers, paid lobbyists and low income housing advocates seeking to place as many units as cheaply as possible into every area of the city. You can read their proposal here. They are entitled to advocate for their positions. However, the Group had no neighborhood representation whatsoever. Thus, the report is not a compromise of any fashion with anyone who lives in any of Tacoma's neighborhoods. The fact is that Tacoma's neighborhoods have compromised again, again and again to accomodate growth in Tacoma. The Group's recommendations once again takes direct aim against single family neighborhoods under a laundry list of proposal "tools." 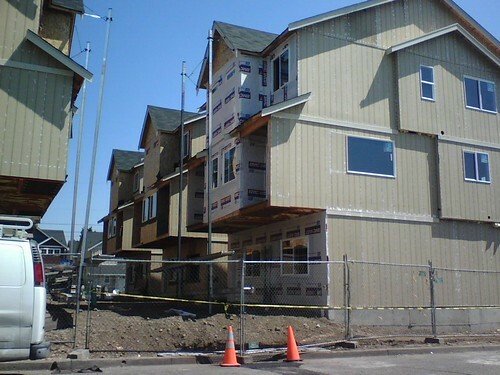 The new developer proposal to expand "affordable housing" released last week requests again that developers be allowed to expand where they place ADUs in single family neighbrohoods. Many of these desires of developers have long been opposed by neighborhood and historical groups because of the damage they inflict on single family neighborhods. Many people still believe that single family neighborhoods should play some role in Tacoma. There is nothing good and noble about forcing every area in Tacoma into a land of apartments and filling every yard with units. Families should be able to find a house in a single family neighborhood in Tacoma without being forced into the Federal Way or Puyallup to do so. Does every neighborhood need to look like the Tacoma Mall mixed use center? Because many of the recommendations would destroy the character of single family neighborhoods and have been discussed and debated at length many times in the last few years, they should (again) be rejected. Tacoma has a huge supply of underdeveloped land that could be built on without threatening neighborhoods. by jenyum on 2/10/2011 @ 9:29am Let's see if we can get the existing units currently under construction financed and completed before allowing any more. by Jesse on 2/10/2011 @ 9:48am Having an ADU in a basement of a house or in the back yard in a small 500 sqft cottage is ok with me. If they are considering an ADU as pictured above, I'd call that multi-family and I'm pretty sure the city would too. Here are some single family houses in Tacoma with "ADU" as a search word in the listing. These are the only eight listed on MLS in Tacoma right now. by fredo on 2/10/2011 @ 10:00am If the accessory dwelling units are occupied by little old grandmas or hot college coeds, I don't see any problems. If they are packed with illegals operating chop shops or transitional housing for ex-cons, I see big problems. by NineInchNachos on 2/10/2011 @ 11:41am North End Neighborhood Council is gunning for Fredo City! by Erik on 2/10/2011 @ 11:58am @Fredo: One cannot control who rents ADUs which are crammed into yards. Often, investors try to divide up houses and yards to try to increase their rents as much as possible to increase their cash flow and smaller units are often subleased to who knows who with no rental agreement or contract whatsoever. by Erik Hanberg on 2/10/2011 @ 3:23pm Erik, by property value, aren't the neighborhoods with the most ADUs the most valuable here in Tacoma? I don't have a chart to back me up, but the mix of duplexes and multifamily zoning with single family homes in north Tacoma coincides with some of the highest property values as well. I don't think they detract from the neighborhood, and in fact, probably make it more likely that places like the Parkway and Dave's Meats can exist to serve the neighborhood. by Erik on 2/10/2011 @ 11:37pm @Erik: I have not seen any information concerning the financial effect of adding ADUs to houses. I would guess every neighborhood in Tacoma has at least some houses with some sort of ADUs as they are allowed by law. Yes, filling up the yards of single family houses with small rental units may very well increase the cash flow, and thus, and the financial value of the real estate. Multifamily zoning is essential to have in a city and Tacoma has many varieties of it. However, the question here is whether Tacoma should retain any meaningful single family zoning. Some residents in the city believe that this option should still exist. by fredo on 2/11/2011 @ 7:09am This attempt to "eviscerate" our neighborhoods knows no bounds. The city council is bringing digital billboards to our neighborhoods so that we may become an urban ghetto. This despite the fact that Tacomans have expressed their intention of getting rid of billboards for the last 23 years. Point being, the will of the people is of no concern to the city council. The decisions about our city don't seem to made in a public forum but rather in "executive session" or perhaps over a round of cocktails. One one doesn't need to look far to see these ADUs are already installed around Tacoma. I see RVs hooked up to extention cords and plumbing everywhere. It's like people want their own little Fredo City in their own backyards!